Onions and garlic are very high in fructan, one of the FODMAP groups of carbohydrates that are believed to contribute to symptoms of irritable bowel syndrome. People on a low-FODMAP diet try to avoid them. Other people may find they have food intolerances that can be triggered by these foods. Cooking without them can be difficult. Here are some strategies. Garlic and onions are often used in cooking as aromatics—foods that add a savory aroma and flavor to other dishes. They're found in cuisines around the world, making it difficult to avoid them by sticking to foods from a certain geographical area. Often, garlic and onions are added at the very beginning of cooking to mellow their flavors before building a sauce, soup, or other complex dishes. 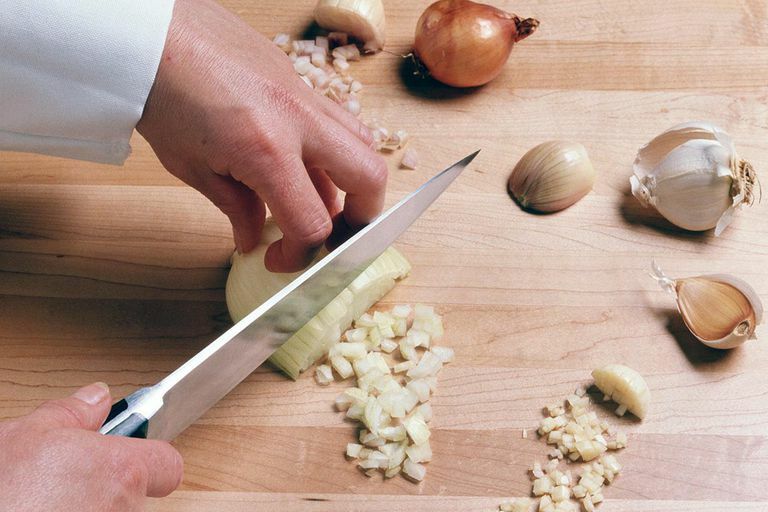 In these situations, the flavor of onion or garlic may be critical to a delicious dish. Most of the time, though, you can find a good substitute. Fennel has a licorice-like taste but onion-like texture. Try it with chicken or fish. Celery is among the most common aromatics. Bell peppers are often used in Cajun cooking. Green peppers and celery are a good base for rice dishes or savory stews. Carrots are used as an aromatic in French cooking in combination with celery. Celeriac, or celery root, is the knobby root of one variety of celery. Peeled and diced, it can be used as an aromatic in sauces or stews. Peppercorns: white, pink, or Szechuan pepper can add different flavors to your cooking. Cumin's distinctive taste that may work well in some recipes, especially where garlic is used raw. Horseradish, freshly grated, can add some of the pungent notes you might otherwise lack. Ginger and galangal have distinctive flavors but may be useful in stir-fries as aromatics. Asafoetida is a spice from India that has a very strong smell. When added to warm oil, it tastes much like garlic and onions. You only need a little sprinkle, as it is very strongly flavored. Garlic powder and garlic salt are made from dehydrated, finely ground garlic. Onion powder and salt, likewise, are made from onions. Ask your gastroenterologist or doctor before trying another form of a food that has caused painful symptoms in the past. Those avoiding garlic and onions due to FODMAPs can use garlic-infused oil as the fructans are not fat-soluble. You can buy infused oil or saute onions and garlic in oil and discard the solids before using it in your dish immediately. Note that making your own infused oil and storing it has a risk of botulism, so you may want to buy commercially prepared infused oil for safety. Frequently Asked Low FODMAP Diet Questions. Monash University. Gibson P, Shepherd S. Evidence-Based Dietary Management of Functional Gastrointestinal Symptoms: The FODMAP Approach Journal of Gastroenterology and Hepatology 2010 25:252-258. Are Avocados Good for IBS? Is Slippery Elm a Good Thing to Take for Your IBS?